Buy your own piece of the excitement and sophistication of Las Vegas with a timeshare purchased on the resale market at WorldMark Las Vegas – Boulevard. 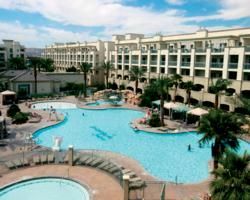 Located only four miles from the Vegas Strip, this resort offers the quiet atmosphere of resort with a location close enough to the Strip to get your Vegas groove on. With a Las Vegas timeshare for sale with WorldMark, you enjoy a comfortable vacation condo equipped with all the essentials (and more! ), while maintaining the ideal location only moments from the Las Vegas Strip. Your timeshare resale is equipped with a studio, one, two, or three-bedroom layout, sleeping up to eight comfortably. 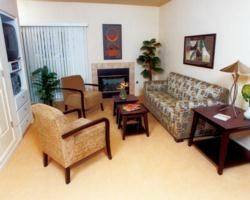 Each unit is furnished with such amenities as a full kitchen, cable TV with DVD player, sleeper sofa, fireplace, washer and dryer, and balcony or terrace with unparalleled views. With their modern, upscale furnishings, you will never want to leave your resort. WorldMark Las Vegas - Boulevard provides ample opportunity for fun suitable for all ages. Its swimming pool area is quite expansive, with separate children’s pool, lazy river, and hot tubs. The resort also offers a fitness center, arcade and game room, sports courts, outdoor children’s play area, small on-site market for last-minute essentials, and a complimentary shuttle to the nearby Strip. Your WorldMark Las Vegas - Boulevard timeshare is located only minutes from the Las Vegas Strip, with complimentary shuttle service throughout the day. Enjoy visits to the world-famous casinos including MGM Grand, Bellagio, and Caesar’s Palace, top entertainment options including touring A-list singers and unique, live shows from such companies as Cirque du Soleil. Step outside the Vegas bubble and visit the nearby Red Rock Canyon for a more natural look at what Vegas has to offer. Contact WorldMark Las Vegas - Boulevard Specialist Today! The resort had very roomy condos, with multiple bedrooms available, great swimming pools & Jacuzzi's and close access to the Las Vegas Strip. There were activities for family or adults. Driving distance to an international airport, Hoover Dam, Lake Mead, and many of the casinos that have outstanding shows.